The Audi SQ8 performance SUV could adopt the 4.0-liter twin-turbo V8 diesel from the current SQ7. The reveal of the signaled the start of the manufacturer’s ambitious plans to take on the likes of the , Range Rover and in the high-end luxury SUV market. According to Auto Express magazine, the Q8 will also be joined by a hot SQ8 performance model. "The Q8 is the brother or sister to the new A8, so it will be high-end luxury", Dietmar Voggenreiter, Audi board member for Sales and Marketing, revealed. But could there be a high-performance SQ8 version? That's something I would like to do", he affirmed. Auto Express went on to say that the SQ8 is likely to adopt the same 4.0-liter twin-turbo V8 diesel as the current SQ7, meaning it would develop 429 horsepower. In the SQ7, an electric-powered compressor is boosted by an advanced 48v electrical system to help spin up the twin turbos at low revs. This all helps to give maximum response and minimum turbo lag, allowing the SQ7 to reach 0-62 mph in 4.9 seconds and a top speed of 155 mph, so you can expect the performance to be similar in the SQ8. 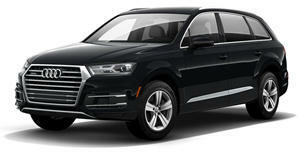 The high-end luxury SUV may not be the only Audi to be fitted with the 4.0-liter TDI, however. Rumor has it that the engine could make its way into a diesel version of Audi’s SQ5, the alongside the Q8 Concept. Currently, the range-topping SQ5 features a 3.0-liter, twin-turbo V6 generating 354 horsepower and 369 lb-ft of torque through an eight-speed automatic transmission.